Background: In order to combat neurocysticercosis, effective and novel Fixed Dose Drug Combinations (FDC) of combination dosage regimens have been always under trial; with Albendazole (ABZ) and Praziquantel (PZQ) combination being one of them. Such outcome is basically dependent on the pharmacokinetic profiling of their metabolites such as Albendazole Sulphoxide (ABZSO, active), Albendazole Sulphone (ABZSO2, inactive) and PZQ-TRANS; followed by their back extrapolations to suggest a safe, however potent dosage regimen. Objective: Development of a novel, rapid yet sensitive column switching RP-HPLC method for routine estimation of the aforementioned drugs and metabolites. The improved dosage version in combination is also targeted. Methods: Pooling rat plasma, with column-switch, parent Albendazole-Praziquantel combination was estimated at 225 nm using Enable C-18G column, whereas Albendazole Sulphone and Sulphoxide were estimated using Phenomenex C-18 Luna column at 290 nm. Results: The method showed high accuracy recovering 92~113% of the metabolite or drugs with LOQ as low as 5~50 ng µL-1. Moreover, administration of ABZ-PZQ combination revealed about 3 times slower elimination of active ABZSO than by solitary administration of ABZ. The former also achieved higher Cmax (77.8078 µg mL-1) compared to the latter (69.685 µg mL-1). 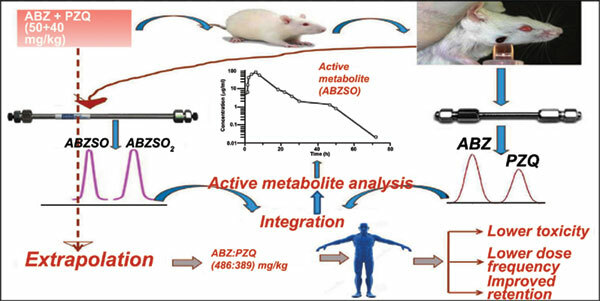 Also, ABZSO t1/2 in the former has been estimated as 4.25 h compared to 1.38 h of the latter indicating slower ABZSO metabolism in combination therapy than the solo one. Conclusion: The improved pharmacokinetics data could be attributed to the synergistic effect of ABZ and PZQ with each other. This has led to the designing of a novel safe ABZ-PZQ combination dosage regimen for therapeutic applications. Albendazole, Albendazole Sulphoxide, Albendazole Sulphone, Praziquantel, HPLC–UV, Column Switch.